Along with economic growth, our country today is brimming with self-confidence, big dreams and national pride. It is during these times like this that historic feats are achieved. These are also times to cleanse the society of existing evils. One of such evils is violence against children. Millions of children in India become victims of brutality and violence, in the form of child trafficking and child sexual abuse. Child trafficking is an organized crime in which children are apprehended at the source, on the route and at the destination, often to be trafficked or forced into labour or sexual slavery. The statistics are damning. A child is sexually abused every half hour in India. Every 2 minutes a child is sold. Despite the fact that child trafficking is a part and parcel of our everyday life, the public remains unaware about the extent and seriousness of this crime. The fact is that society is not only affected by child trafficking but is also in many ways involved. From the domestic servant we hire from a placement agency, to the kids we spot selling goods at traffic lights, to underage children forced to work in massage parlours –a majority are faces of child trafficking that we witness but ignore. To continue ignoring this serious crime not only threatens national security because of the black money that child trafficking fuels, but also endangers the childhood of many more children. In addition, there has been an alarming rise in sexual violence against children. Fear and social inhibitions often stop our daughters and sons from reporting these crimes, while on the other hand, parents try to hide the brutalities because the perpetrators are often known to them. In such a scenario, there is a growing sense of fear, particularly in the case of teenage and young girls in the family. It is evident that these crimes cannot be curtailed only by policing or state efforts. Even the current laws and schemes for protection of children are not common knowledge for the public. There is an urgent need of mass awareness and public mobilisation on these issues. India has had a tradition of ‘yatras’ or marches for social rejuvenation and reawakening, such as the Dandi March in 1930. It is now time for another such mass awareness movement for building a safe India for our children. It is against this backdrop that Nobel Peace Laureate Kailash Satyarthi has decided to launch a Bharat Yatra, to catalyze the entire nation towards a ‘Surakshit Bachpan-Surakshit Bharat’ (‘Safe Childhood-Safe India’). Through the Bharat Yatra, efforts will be made to build a common consensus to end all kinds of violence against children, specially child sexual abuse and child trafficking. The Bharat Yatra will be organized between August to October, 2017, from Kanyakumari to Delhi. Five other smaller yatras from all four sides of the country will merge with the main Yatra. Thereby the Yatra will cover 15,000 kms across 25 states. 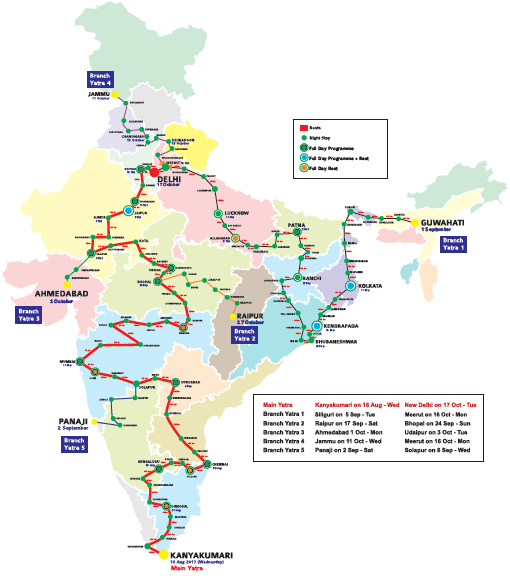 The Route Map of the Yatra is attached. Around 10 mass contact and awareness programs will be organized every day of the campaign. These grassroots programs will witness participation of school and college students, along with leaders from diverse social, cultural, religious, media and corporate organizations. Each day, thousands of local residents would join them in solidarity and support. The programs would use theatre, music and folklore in local languages to create mass awareness against violence inflicted on children. Sh. Satyarthi and his movement have had a long and successful history of organising Yatras. The historic 1998 Global March against child labor across 103 countries and the 2001 March from Kanyakumari and Kashmir to Delhi to demand fundamental education for children, are some instances where Sh. Satyarthi has mobilised millions of people across the world to create public awareness about child rights. They have also catalysed changes in laws related to children in India as well as globally. The Bharat Yatra is yet another milestone in this journey. It’s being undertaken as part of a 5-year long, global ‘100 Million for 100 Million Campaign’ in which youth will be changemakers for a child-friendly world. Given the wide expanse of exploitation of children, it is our effort to involve every section of society as a stakeholder in the Bharat Yatra. The Yatra will be led by a 100 core marchers among which key would be survivors of abuse and trafficking. Other marchers will include students from schools and colleges, families, social activists, government officials, faith leaders, and ordinary citizens. Virtual Walk – 1 lakh Kms (People commit to run remotely). The Yatra is planned to be launched from Kanyakumari on 16th Aug 2017, at Vivekanand Rock Memorial. The Flag Off ceremony will have citizens, dignitaries and faith leaders from across the country. The culmination of the Yatra is planned to take place on 18th October on Diwali eve in Delhi, with a grand ceremony. March with the Yatra when it arrives in your town, city or village. Organise community marches around your area pledging zero tolerance to child sexual abuse and child trafficking. Devise creative ways in which you or your peers want to join the Bharat Yatra and share with the KSCF team. Provide support in any manner convenient to you for this most ambitious and historic nationwide march.